This is about as easy as a recipe can get. 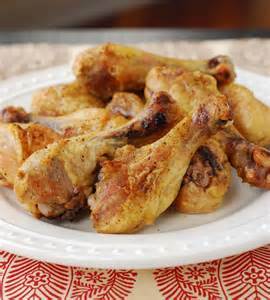 Just pat dry the drumsticks, spice and cook in a high oven. Then you will have crispy goodness for the family. Trim of any extra skin and any loose joint pieces. Spice to taste. A light sprinkling of my 7:2:1 seasoning is great. If you don’t have that, mix 1 tablespoon kosher salt, 1 teaspoon pepper and optionally 1/2 teaspoon garlic powder (granulated preferred) and 1/4 teaspoon Cayenne (skip for little ones). This makes more than you need. Keep for next time. Placed on a prepared cooking pan with the thicker part of the drumstick to the outside. I usually line with aluminum foil to help cleanup. A rack elevates the chicken to help all sides cook evenly. You can do it without the rack but better with. Of course, a heavy spray of PAM on the rack or foil. Cook to 185 plus internal temp. DO NOT STOP SHORT of 185. About 35 minutes in my oven. Let set for 10 minutes before serving. They are way too hot to eat right away and will be better after a rest.